"Someone's in my fruit cellar..."
I've been on an Evil Dead kick as of late (for obvious reasons). I revisited the original flick in a theater last night with the help of our pals from Sun-Ray Cinema and I'll be subjecting my poor little brain to the remake tonight (I can't wait...it feels like forever since I've seen a new film in a packed theater). Today's scene should really be from The Evil Dead, but when it comes to Sam Raimi's seminal 1981 horror flick vs. Evil Dead 2, I've gotta go with the latter. The budget's better, the focus is more on Ash, and the creepy is layered on thick. I love the buildup to the attack in this film. The recording of the professor and the reveal of what he's done is genuinely creepy and the surprise waiting for Ash down in the cellar comes suddenly and effectively. Evil Dead 2 is definitely funnier than its predecessor (laying the groundwork for the outright shenanigans to come in Army of Darkness) and Bruce Campbell gets to flex his talent for humor and his charisma towards the end of the scene. Before you go, tell me a little bit about your relationship to The Evil Dead series. Do you like the films? Hate them? I got into them in my last few years of high school and I've never looked back. Enjoy your weekend, my little Deadites! I hope you will...join us...in seeing Evil Dead this weekend. 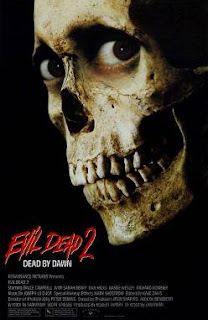 LOVE Evil Dead 2! Easily my fave of the series! 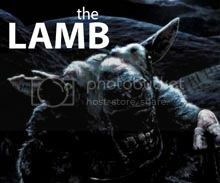 Can't wait for the remake, seeing it Monday! I actually think the first one needed a remake (I guess Raimi did too, hence Evil Dead 2!) It's inventive but flawed. Hope the remake is as good as the trailer promises. Pete - I think Army of Darkness is my favorite of the series but ED2 is definitely my second favorite. I hope you enjoyed the remake. I liked it a lot. The first one is definitely a classic but a bigger budget really did wonders. Thanks for reading! Markus - I think I saw Army of Darkness on SciFi one night and went from there. Actually, now that I think about it, I think I went in reverse order. The tone of the remake is definitely different. But, then again, the tone of the original is a lot less jokey than the two sequels. I'm pretty confident that, if this series continues (which I think it will) they'll get gradually goofier. Lastly - did you stay for the final scene after the credits?? ?